Happy Birthday to Democratic Party favorite Harry Reid. The retiring Senate Minority Leader turns 77 today. Reid was born in Searchlight, Nevada, in 1939. He was first elected to the House in 1982, then moved up to the Senate four years later. He is wrapping up his fifth and final Senate term this month. Sen. James M. Inhofe’s office took some photographs ahead of the Oklahoma vs. Oklahoma State football game this Saturday. 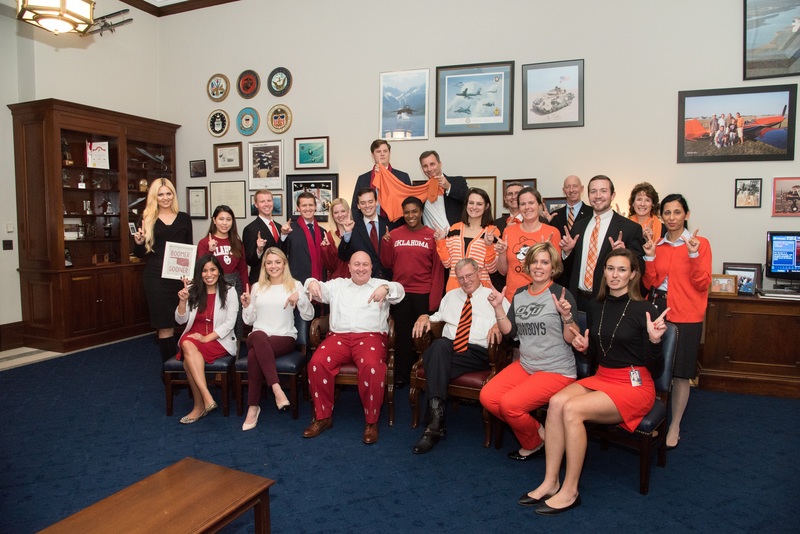 The rivalry is known as the Bedlam series and while their office represents the state, the staff and the senator expressed what team they are routing for. Michelle Seger, legislative counsel for Rep. Alex Mooney, R-W.Va., has been named senior associate at the public affairs and government relations firm, Venn Strategies, LLC. The firm has also hired JoHannah Torkelson as vice president. Torkelson works for the President’s Council on Fitness, Sports & Nutrition. — Senate Majority Leader Mitch McConnell on outgoing Louisiana Republican Sen. David Vitter’s eating habits, in a floor speech celebrating Vitter’s tenure on Thursday. — Senate Minority Leader Harry Reid accidentally beginning his floor speech before McConnell was finished with his. — Sen. Christopher S. Murphy, D-Conn., on news reports that the North Dakota Democrat was being considered for President-elect Donald Trump’s Cabinet. Rep. Eddie Bernice Johnson, D-Texas, 81. Rep. James B. Renacci, R-Ohio, 58. Rep. Grace F. Napolitano, D-Calif., 80. Have any tips, announcements or Hill happenings? Send them to AlexGangitano@cqrollcall.comKellie Mejdrich and Bridget Bowman contributed to this report.